This is what our lower field looked like yesterday. Did we misread the instructions for the Cornell soil test? No. 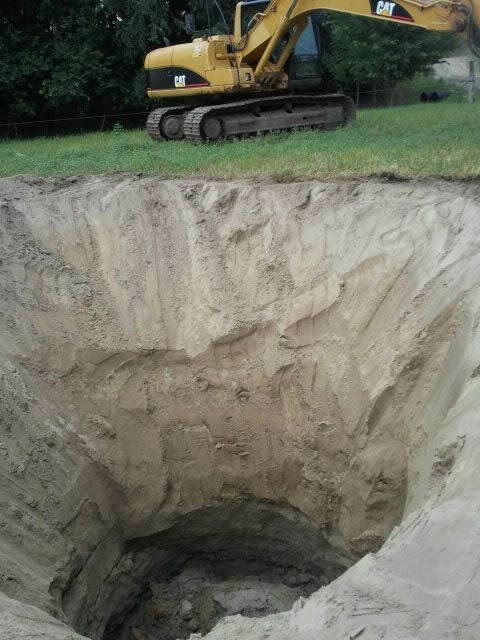 With help from the Natural Resources Conservation Service, we are trying to dig a shallow well. I say “trying” because it is not working. After a couple of inches of top soil, the next 16 feet is all sand. But actually, from a soil testing point of view, this pit makes a dramatic point. Before we started grazing livestock here, our farm was tilled and planted with row crops for generations. Sandy soil makes for easy plowing—there are no rocks at all. But tilling reduces soil organic matter, especially in sandy soil. We are now left with barely a thin film of topsoil. Grazing will reverse that trend, but it will take generations for the topsoil to grow to a significant depth. I’m looking at this photo and thinking this field is a perfect place to experiment with biochar. Wow….i wouldn’t get to close to that hole! No water, but on the other hand…you are lucky to have so much nice sand! What an amazing story this sandy soil tell! Thank for explaining so much farming practices on your web site! Wow! If we did we generally hit ledge within a few inches, maybe a foot. In rare spots we can go down a few feet. That hole looks scary.